It seems like every time I scheduled my first lesson with Trainer J, Murray found some way to sabotage it. First, by being sore as hell after standing in a stall for 3 weeks. Next, by being insanely rude to the vet and requiring cowboy lessons first. Most recently, by freaking out when the new farrier tried to burn his feet during hot shoeing, and becoming pretty sore up front. The farrier and I made a plan to get Murray more on board with the idea of hot shoeing (slow, measured exposure) and TrJ and figured we’d just move forward with the lesson as best we could. It was short, but very informative. I expected my first lesson with TrJ to start like a clinic. Tell me about your riding, tell me about your horse, tell me about your goals. It did not start like this. TrJ came in with a plan for me. I was trotting Murray around on a long rein to loosen him up a bit, and TrJ had me come back to a walk. She wanted to give Murray a bit more of a chance to stretch out, and make some position modifications to me that would help us. She said she has noticed that I tend to let my heels get out behind me — absolutely true, and something I haven’t actively thought about fixing in a while. She also pointed out my atrocious habit of shoving Murray in the walk with my seat. These were the first two things TrJ wanted me to fix. 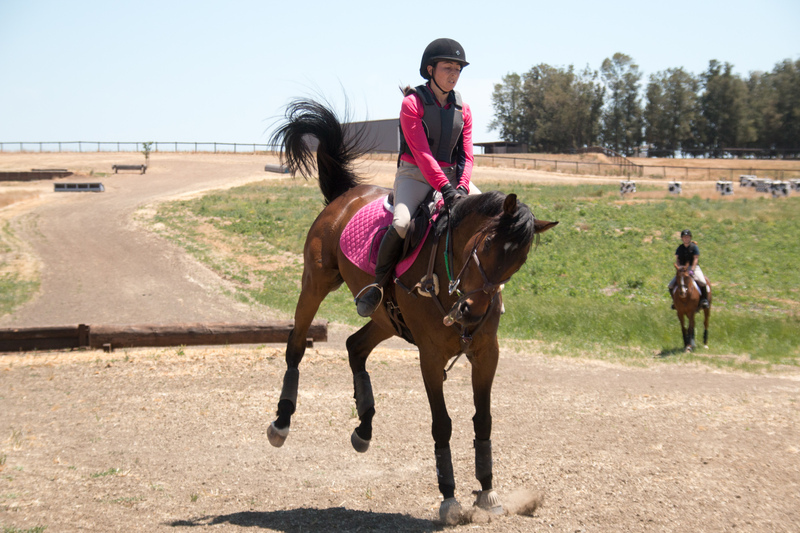 So I dropped my stirrups, and thought specifically about NOT shoving. Unfortunately, this kinda ends up making me stiffen my seat, it doesn’t give me a following seat. TrJ also told me to sit back on my pockets more, and had me lift my knees up over the flaps and sit on one of my hands to feel my seat bones. She told me to bring my legs back down and really relax them around the saddle, letting gravity pull my heels down and not ramming my toes up. 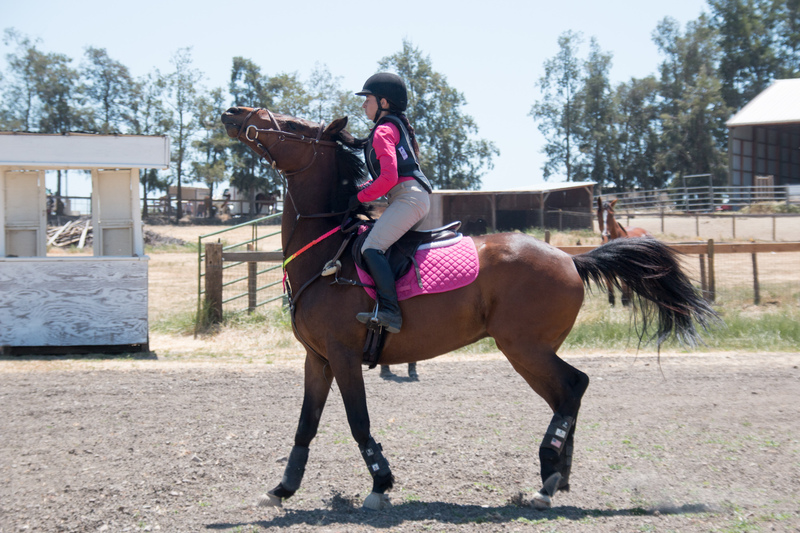 This struck me as a little bit counter to the “sucking yourself into the saddle” idea of biomechanics, which made me a titch uncomfortable, but I went with it. We worked at the walk for a long time. When my seat got too shove-y, TrJ had me drop my chin to my chest, which had the side effect of stilling my shoving muscles and really letting my seat follow. Whenever I started shoving again, I could drop my chin down and rediscover the feeling of following, and then lift my head up to, you know, look where I was going again. 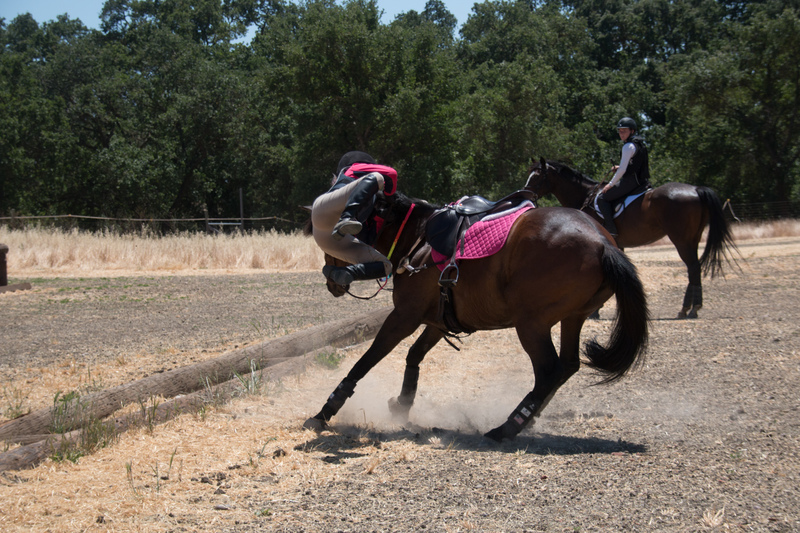 I was definitely a little skeptical about this approach to my riding. Like, I know that shoving with my seat is a really bad habit and I shouldn’t do it. 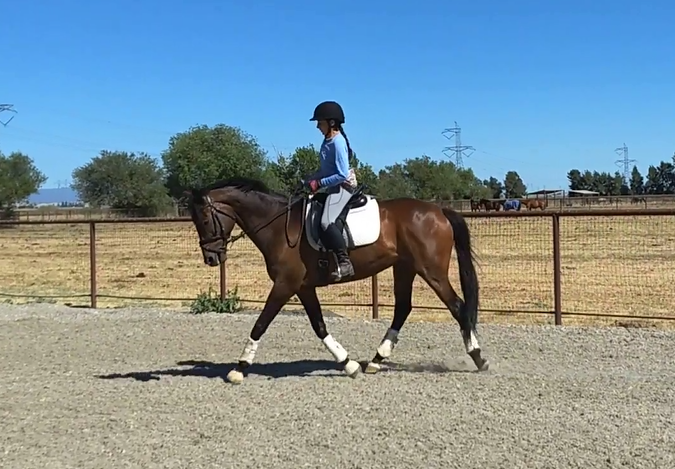 But I was not sure that starting there was really the best approach to creating a dressage horse who is more confident in the connection. But lo, when I stopped shoving with my seat, Murray started taking bigger (albeit slower) steps and stretching down over his topline. At one point, he even jostled the bit lightly in my hands with his tongue — not in a grabby, rooting kind of way. But with his head on the vertical, just playing with the bit in my hands. That was a cool new feeling. As part of not shoving with my seat, TrJ told me to relax my lower back, and feel like someone was pulling my torso back by the belt and the bra strap. I should have clarified during the lesson, but it didn’t seem like she wanted me leaning back. She wanted me resisting that feeling, I think. Regardless, when I stacked my torso up vertically (I have a habit of letting my cereal box fall forward from my hip) and became shorter and wider, TrJ was happy with the attempt. 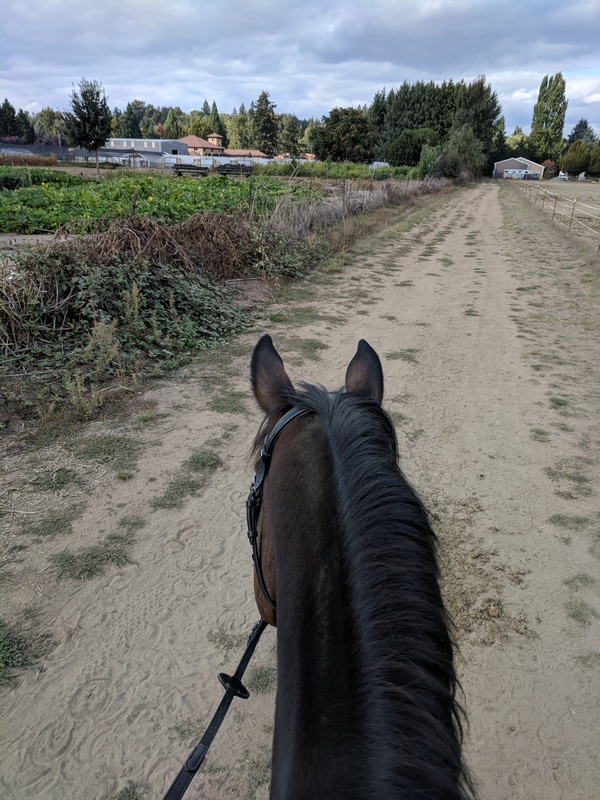 Doing all of these things — relaxing my legs, following instead of shoving with my seat, “relaxing” aka squashing down my lower back, and keeping my torso vertical really made my seat bones connect with the saddle more. It felt like each seat bone had more surface area on the saddle, maybe double or more than what they had at the start of the lesson. And all of this was accomplished just at the WALK. fave gait. we soooooo good at it. I had some strange-not-amazing feelings about this lesson afterward. It was quite different from what I have worked on with a biomechanics-focused instructor (Alexis) and from the path I’d been taking to improve Murray’s connection and throughness this last summer. And, I will admit it, I’ve spent lots of time on the ground at this barn watching TrJ’s riders, and they aren’t necessarily bear-down riders. I’m very comfortable with the biomechanics stuff, and I liked the progress Murray and I made this year. All of these things, plus the fact that TrJ didn’t ask me about what I wanted felt weird. After more thought, I realized that it just feels weird because it’s different. TrJ has a program, and lots of successful riders in that program. She watches people — she really watches them — even when they aren’t in lessons. 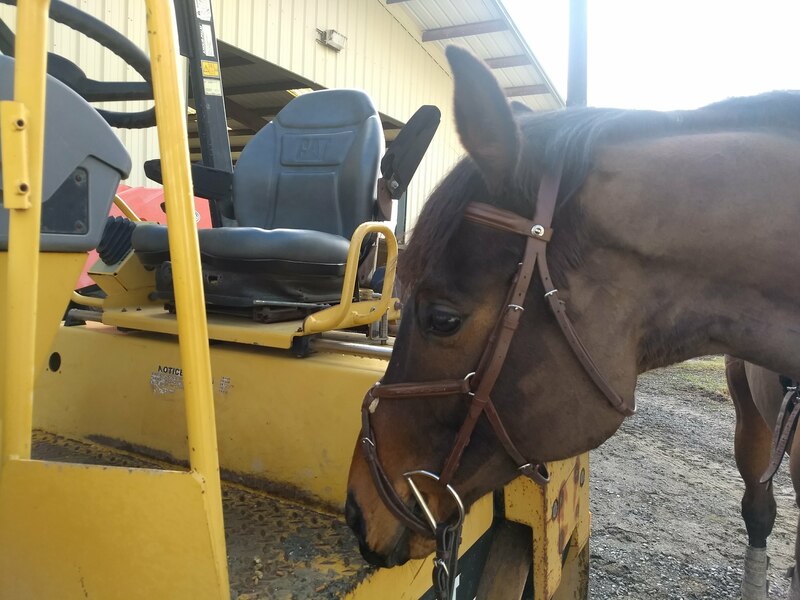 TrJ also has a very specific way she wants people to ride, and she has a method of building those riders to get to that way. Murray’s feet seem to feel better, and he’s back to his usual level of out-of-shape-not-using-himself-not-terribly-cute-mover-ness. I’m looking forward to making more lessons happen, and refusing to accept Murray’s attempts at sabotage. 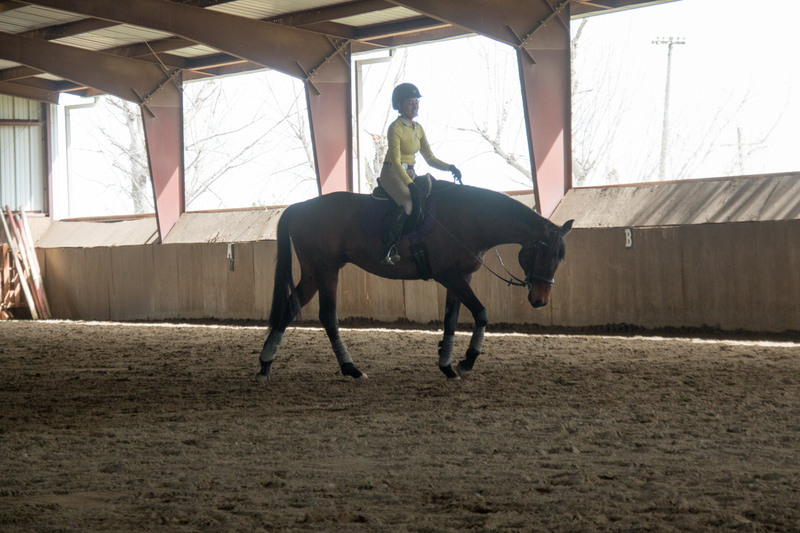 One huge, different thing about my new barn is that now Murray and I are in a program. It’s not oppressive, but it’s there. It’s not what I thought of when I (naiively) imagined a “program”. It’s not hallways of monogrammed trunks all in the same color and uniform saddle pads and a military requirement to buy that barn’s preferred brand of high end saddle. 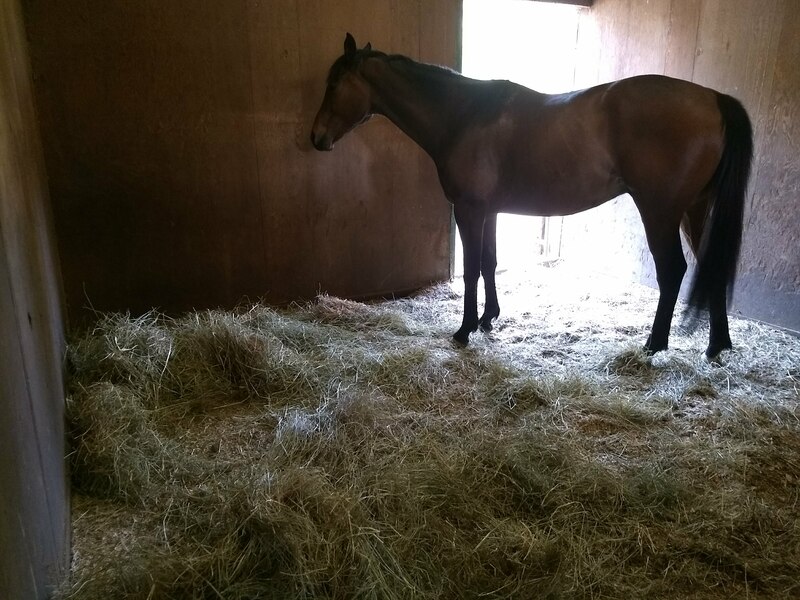 It’s not horses being fed up (or down) at the trainer’s discretion, without the option for preferred supplements or feed, or a requirement to be in training n-days per week or lessons m-days per month. first day in blankies, with a new friend! But there is a system. 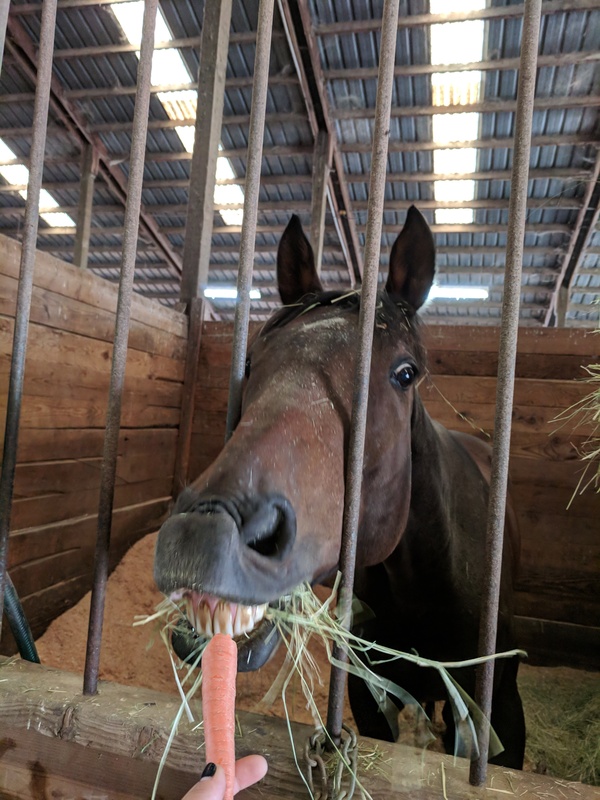 There are a few types of feed the barn gives to all horses there at least twice a day (a ration balancer), and they work with you to add in more calories or energy as necessary. They decide what pasture your horse is going to go in (with your input, if you have it) and make adjustments to smaller or bigger pastures as needed. The other day it was cold, drizzly, and foggy for the first time and when I got to the barn Murray was blankied up and happily out in pasture with his new friends. They didn’t ask, they just put on the turnout I’d provided and sent him out to do his thing. If someone needs the vet, they call the vet out and are there for the appointment. They’re there for you, but don’t necessarily force you into their mold. 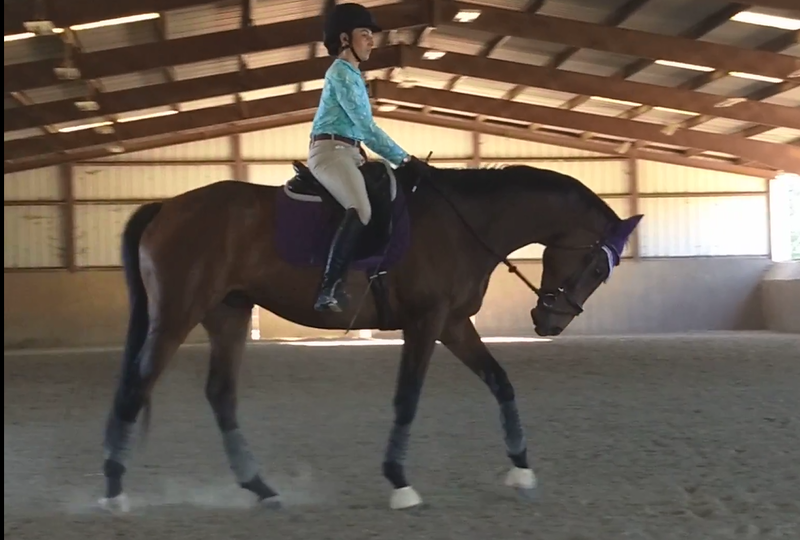 One thing is absolutely true though: every horse at this barn is impeccably behaved. 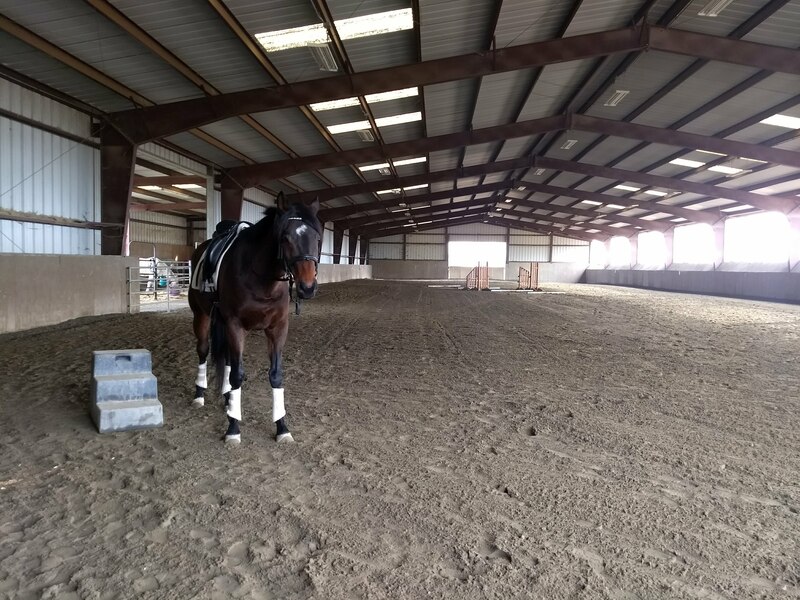 So after had the vet out to look at Murray’s strange lameness and he was about as tolerant of flexions as you’d expect (read: not very), Trainer J and I took a minute to chat about the plan moving forward. Murray flexed slightly positive on the right hind, and the vet thought that his hocks and joints were probably feeling crummy after standing in a stall for 3 weeks. Vet wanted me to get him back into work for a few weeks, then recheck and think about hock injections. Since I don’t have a billion dollars to throw at this problem, and my fall schedule is so spotty and strange, I wanted to develop a plan with Trainer J and get her thoughts. What she said first surprised me. Trainer J wanted Murray to get into horsemanship lessons before we threw joint juice at him, and before we got into regular lessons. She said that he’s spoiled, and that his current behavioral programming bordered on dangerous. The conversation went other places, and we covered all the bases I wanted to. Trainer J wasn’t mean or cruel about it, but she was pretty matter of fact: if I want to be in the program, Murray would have to get in it too. She said I needed to get her horsemanship guy, Cowboy Dave, out as soon as possible. Like the next morning, if he’d do it. Murray is getting way better at walking past the Scary Hoop Houses, and loves being out in the field! So we’re in trainer-mandated Cowboy therapy. I’m not going to pretend it didn’t hurt a bit to hear that Murray’s ground manners aren’t up to snuff. Even though it comes as absolutely no surprise to me. Or anyone who has read this blog for any period of time. It’s just one of those things that always triggers a ton of emotion in me. I’m very open to change and learning new ways, so this isn’t a bad thing to me. But being in such a clear program is certainly different. 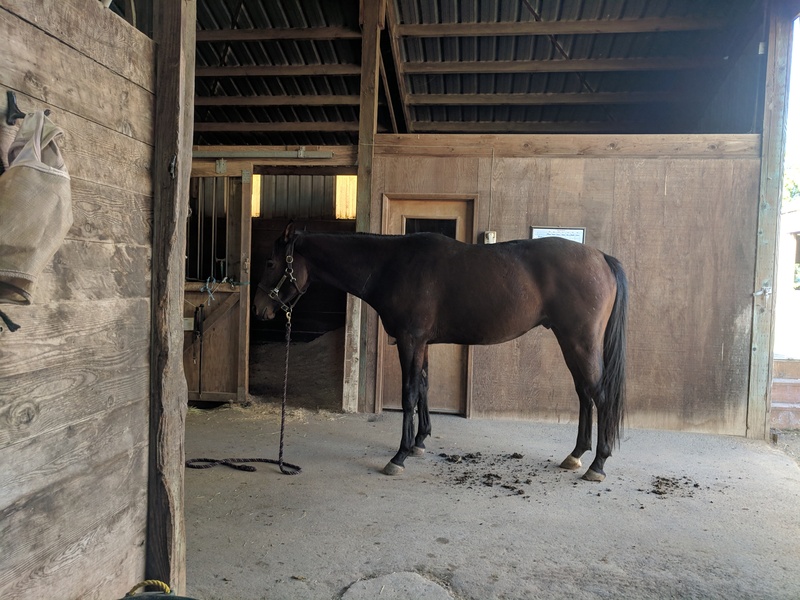 At my old barn, all the horses were held to a much lower standard of behavior (basically: can you go in and out of pasture safely), and beyond that it was the owner’s problem to handle manners. For good or ill. I get the feeling that a lot of places are like that. What do you prefer? More management hands on or more management hands off? Feeding and turnout only, or have them handle everything? If you’d asked me two months ago, I would have said hands off! But… I like the way the horses are here. They’re happy. The cowboy teaches them super well and is a great human teacher also. It’s probably a really, really good thing that they have a dedicated person to go to, to help horses and people communicate. But I also feel like this could definitely go the wrong way…. if all the horses are required to work with a horsemanship person who isn’t so fair, talented, or gentle. This program seems awesome. I’m super glad I found it, and I think it will help us both become better versions of ourselves. Murray recovered excellently from his “pigeon fever”, and though I never got the official culture results back from the vet, it seems pretty unlikely that the one abscess was actually the pidge. 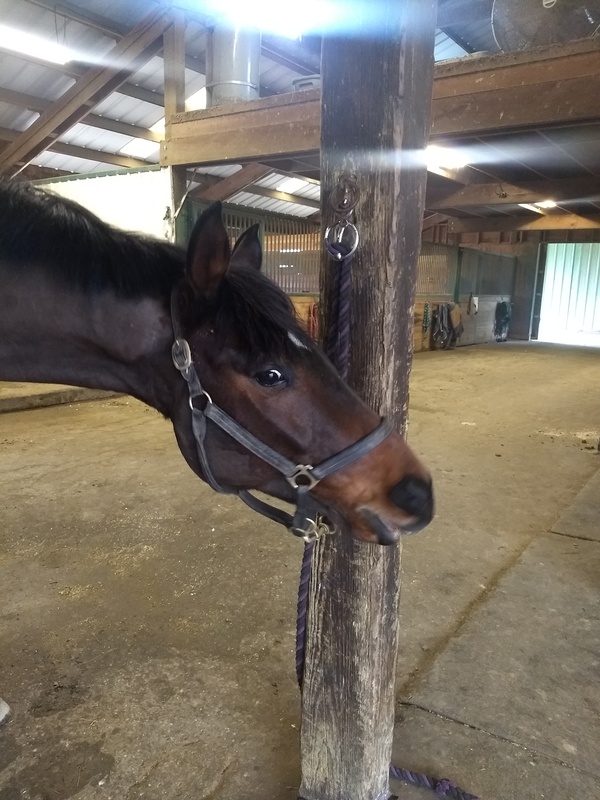 But after a week of standing around in his stall, Murray was feeling a little off and abscess-y, maybe a little stiff from not really using muscles for three weeks, and not quite up to real rides. All just a part of his master plan to avoid real work, I’m sure. I considered giving him some more time off, but we hadn’t yet gotten Murray integrated into the big boys field at the farm. Which meant that without riding, Murray would remain stuck in his stall 24/7. Murray was still sound at the walk, so we walked. And walked. And walked. I mean, there’s only so long that you can just walk around. So these rides weren’t exactly long, but at least we were getting out. 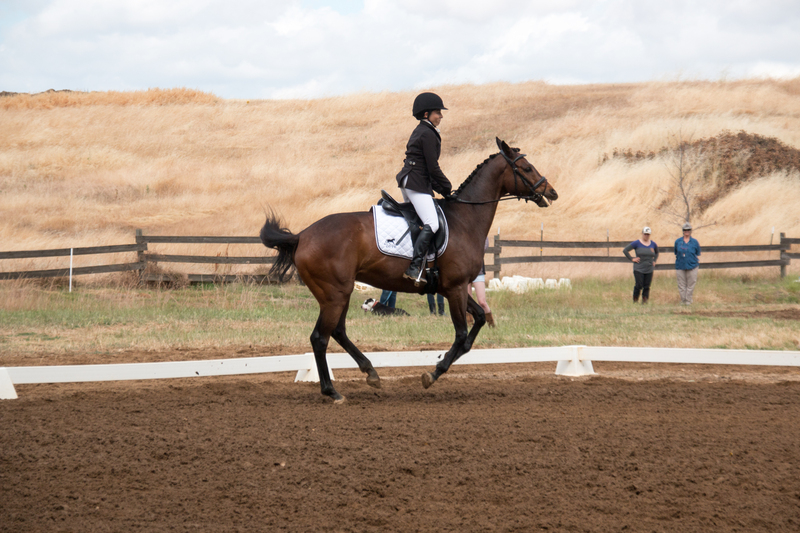 We took advantage of the gallop track and cruised all around the field solo. Murray was very calm, which was fantastic for me. He only got excited when he saw some new friends coming up the way toward us, and he pranced over to them and asked if they wanted to play. Shockingly, neither their riders nor I were interested in Murray playing with them at just that moment. It’s lovely to have a 1 kilometer track so available — two laps around was an easy 2k walk, and helped get both of us stretched out. At the same time, we worked on getting Murray integrated with da boyz. I took him for a few walks around the big pasture (it’s about 20 acres) when it was empty, and let him get used to the perimeter. I did not let him touch the hot wire. I wanted no part of that. And then on Sunday evening after all the horses had come in, we put Murray out with an older pony named Tony, and let them cruise around together for a few hours. 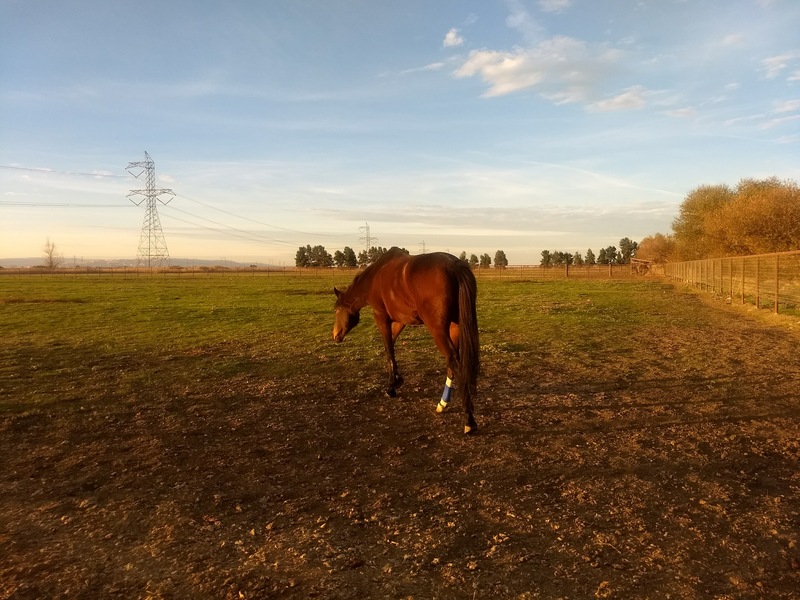 The next morning, Trainer J and her assistant gave Murray a teensy bit of sedation and put him out in the field in the morning. As far as I heard, no other horse in the field thought anything of it. It’s weird having your horse integrated into an already-stable pasture group of 15-ish other horses. I mean, I know how I’d do it if they were chimps. And it’s not the same approach that J took. But this barn has a lot more experience integrating new horses into a field than I do, and a lot more horsemanship overall. So I trusted them, and it went perfectly! On day two in pasture Murray stuck around with his stall neighbor, Delgado. D is very understanding of Murray poking his head into D’s stall every time we go by. And I think that Murray appreciated that D didn’t want to aggressively groom or play with him, or herd him away from other potential friends. Murray is already looking more comfortable after getting a few days of turnout, so fingers crossed whatever this is will just resolve itself. Maybe that silly abscess will just pop or go away or whatever. Or if it’s residual stiffness, it will just work itself out with turnout. We’ll keep plodding along at the walk (and hopefully more soon?) and with the turnout. The vet comes out today to look at another pony, so I’ll have her take a quick look at Murray too because WHY NOT see the vet twice in the month we move.